Anyone who says "LN license when?!" gets banned for -1 years. @sam-pinansky This is a great pick up, i really love the story. I was wondering can we use premium credits on manga? @catstorm information about the ebook releases will be coming later. How does a negative banning even work? I'm gonna follow this because the art is cute and I too am a bookworm. Please have a light novel for it. @sam-pinansky So we can expect that announcement soon? I wouldn't assume that he got the light novels too just because he got the manga. He could be testing the waters for it. Like, if the manga sells well enough, maybe we could get the light novel, sort of thing. I wouldn't blame him, those "light" novels are huge and would be quite the investment. Time will tell I guess. Otherwise, great first chapter. Looking forward to supporting this series. The "banned for -1 years" is obviously a codeword for LN announcement next year. I'm on to you! Looks interesting. I did have the LN in my list of LNs to check anyway. Page 2 ► Given they're poor I don't think they have 2 houses?! 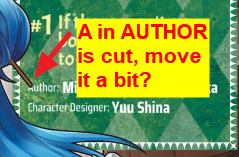 Saw this thinking it was the novel was getting translated and then i saw "Manga." Looking at the spoilery map -- I didn't realize the merchant's guild building was right in the central plaza, hmm. I took a peek at Blastron's translations to try and keep naming consistency where I could. Little did I know that later chapters were changed and early chapters weren't updated to match. Whoops! Of all WN translators I've seen, Blastron is definitely the best, so I would like to keep officially localization similar where possible. That said, I don't think Maïne is a particularly good choice for a romanization. The main thing is that this is an English work for English speakers, and the ï in Maïne will breed more confusion than anything in this respect. The majority of readers will double take upon seeing it, and subsequently just ignore the umlauts over ï and read it as a normal "i". I asked around and the majority of people I consulted did not know how to properly read Maïne (or even how to type ï). With this in mind, I don't think going with Maïne over Maine will add clarity to the pronunciation of the name. People will continue to mispronounce it either way. In which case, I think it's best to just stick with Maine, which won't be visibly confusing to so many people. On top of all this, pretty much every English word using ï (naïve, archaïc, etc) is generally written without it, so there is a pretty respectable precedence for this kind of thing. Personally, I don't think people mispronouncing her name is a big deal. Hard or confusing to pronounce names have been in fantasy novels since the beginning. In my opinion, trying to ensure that everyone reads a name in a single correct way isn't that meaningful, since it won't happen. People will read things as they will despite your best efforts as a writer. So, I think the best thing to do is stick with Maine, let people pronounce it as they may, and leave it at that. Uchino, on the other hand, is 100% my mistake. I don't have any excuse other than the fact the scans were initially... very difficult to read. Upon zooming in significantly I see I did misread the name, and I am grateful we do prepubs so readers can point out dumb mistakes like this before they get worse. Many thanks. Tuuli is a lot more workable and I will try to change Tory to that barring any unforeseen circumstances. I appreciate all input on names like this, as Honzuki has quite elaborate ones. The second Maine's house was intended to be Lutz's house, but a typesetting mishap occurred. We're all getting used to the manga workflow, sorry about that.